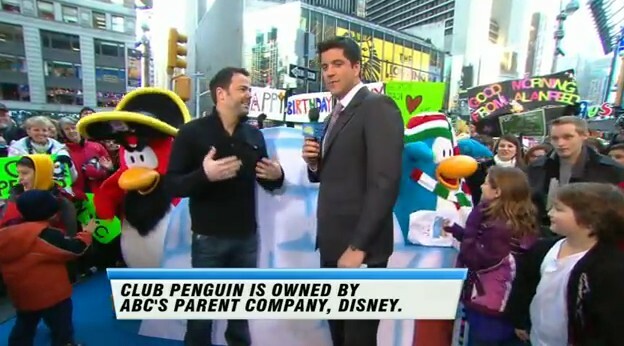 Club Penguin’s Rockhopper on Good Morning America on ABC Channel! | Fosters1537 and Yellow Crown's Club Penguin Guide! ← New Penguin Style December 2011 Cheats! Club Penguin’s Rockhopper on Good Morning America on ABC Channel! Alsooo, if you ever wondered what ex-ClubPenguin-blogger Jman93 looked like, we spotted him on Good Morning America right close to Billybob!! I think even an ex-blogger sometimes would still keep that little in touch of the Club Penguin community! 🙂 I guess Warm Coats Art challenge was a good opening for the month of December in Club Penguin. Posted on December 2, 2011, in Club Penguin, Holiday Party 2011, in Real Life, Merchandise, Parties, You Tube videos. Bookmark the permalink. Leave a comment.